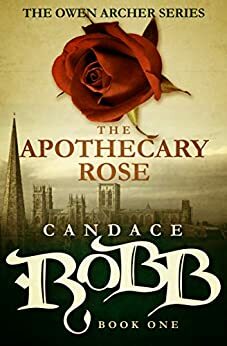 An e-book bargain-The Apothecary Rose by Robb – Joyce's mystery and fiction book reviews with some non-fiction too! The Apothecary Rose is the first of the Owen Archer mysteries by Candace Robb. I read this many years ago, enjoyed it and went on to read other novels in the series. Christmastide, 1363-and, at an abbey in York, two pilgrims die mysteriously dead of an herbal remedy. Suspicious, the Archbishop sends for Owen Archer, a Welshman with the charm of the devil, who’s lost one eye to the wars in France and must make a new career as an honest spy. The Apothecary Rose marks the arrival of a bold and quick-witted detective in this expertly detailed, engrossing tale of medieval life-and death.